Autumn is the time when change is inevitable. We can feel it in a crisp breeze, smell it on fallen leaves, and see it in our gardens. Cuttings from the harvest make for beautiful floral displays. Strands of herbs can be used for garlands before being dried. 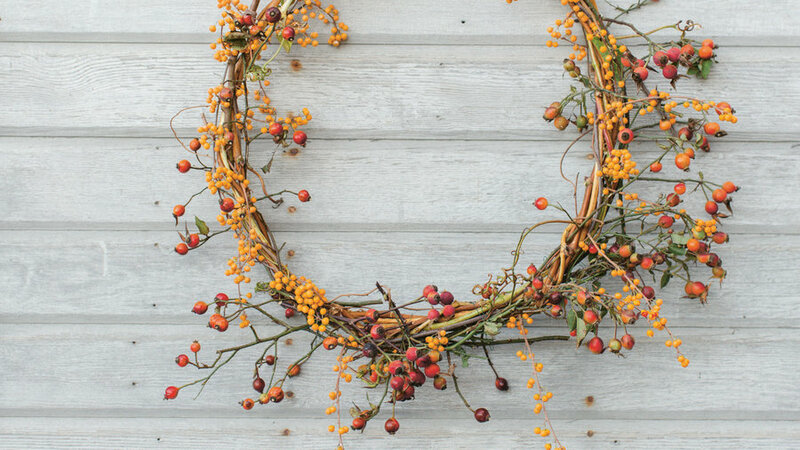 Leaves, berries, and rose hips can be made into beautiful seasonal wreaths. 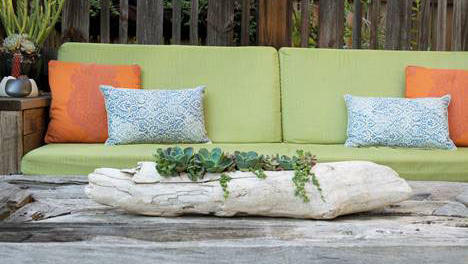 For texture, go with the simplicity of driftwood and succulents. 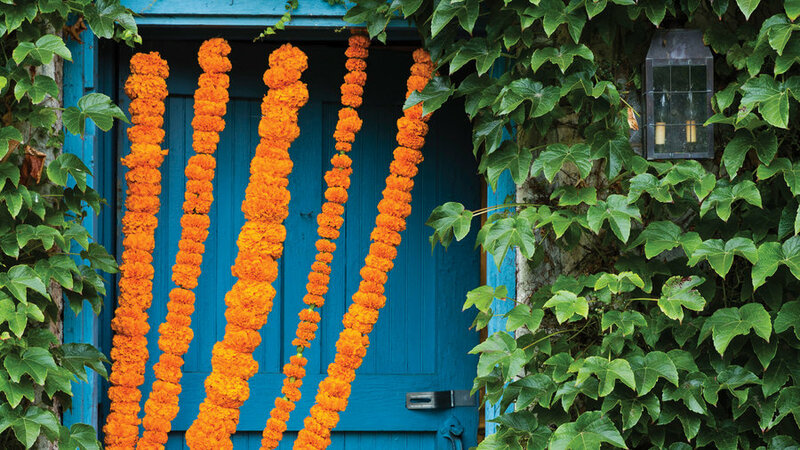 Marigolds are harbingers of autumn that add a burst of dazzle to the season. In , Ariella Chezar advises to thread a 3-8-inch Hawaiian lei or other heavy gauge needle with fishing line. To start, make a knot and tie a safety pin and then string the needle through each flower. The Flower Workshop by Ariella Chezar with Julie Michaels, copyright © 2016, published by Ten Speed Press, an imprint of Penguin Random House LLC. Photographs copyright © 2016 by Erin Kunkel. Trees are in their full, colorful glory this time of year. 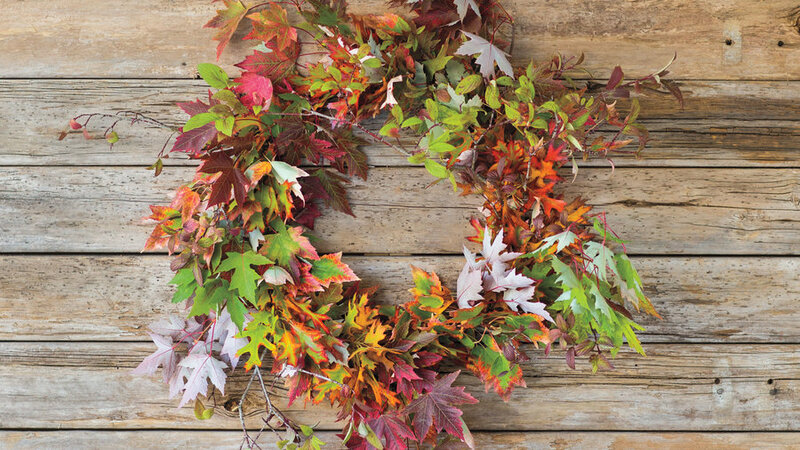 This wreath from is made from a combination of 6 dogwood branches, 6 maple branches, and 6 oak branches. Start with a wire wreath frame and paddle wire. Secure a branch of one to the right side of the wire, add oak and maple, and secure with wire. Continue clockwise around the frame. From Branches & Blooms by Alethea Harampolis and Jill Rizzo (Artisan Books). Copyright © 2017. Photographs by Paige Green. 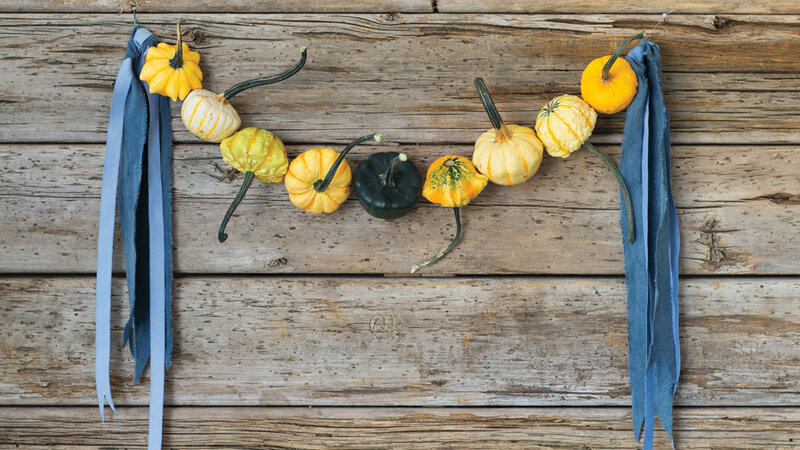 If small decorative gourds are beckoning you from the farmers' market, this is a way to make a decorative garland that can be used inside or outdoors. You’ll need a long, heavy gauge needle, fishing line, and hammer and nails to hang. From by Alethea Harampolis and Jill Rizzo of Studio Choo. Photographs by Paige Green. Published by Artisan, New York. Gardeners harvest their herbs to dry before the first hard frost of the fall. 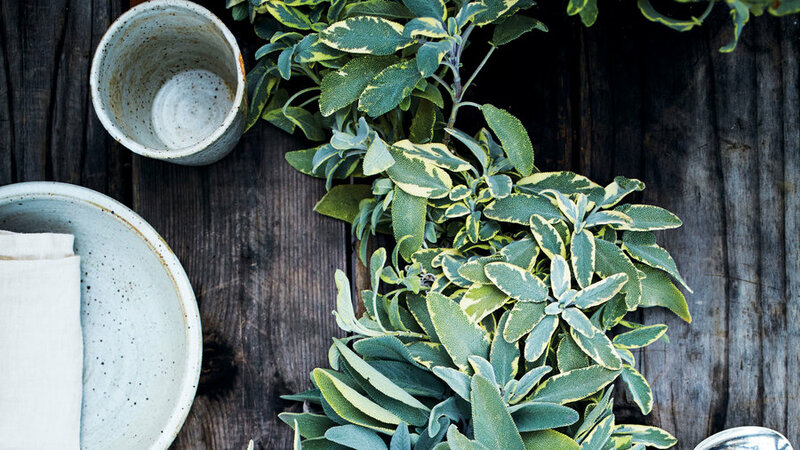 After stringing herbs, the authors of suggest using them as decorative table garlands. Pictured here is sage that’s been fastened onto hemp twine. Then hang to dry and use the herbs throughout the winter. Photo reprinted with permission from Harvest by Stefani Bittner and Alethea Harampolis, copyright © 2017, published by Ten Speed Press, an imprint of Penguin Random House LLC. Photographs copyright © 2017 by David Fenton. As is prepping to let the garden go dormant, they set aside bits and pieces, like fruiting branches, pods, rose hips, and bittersweet for seasonal wreaths. Author and farmer Erin Benzakein advises, “These twiggy creations are intended to represent the unruly nature of the season.” Excerpted from Floret Farm’s Cut Flower Garden, Chronicle Books 2017. Late season clippings from pruning make for unique and lovely arrangements. 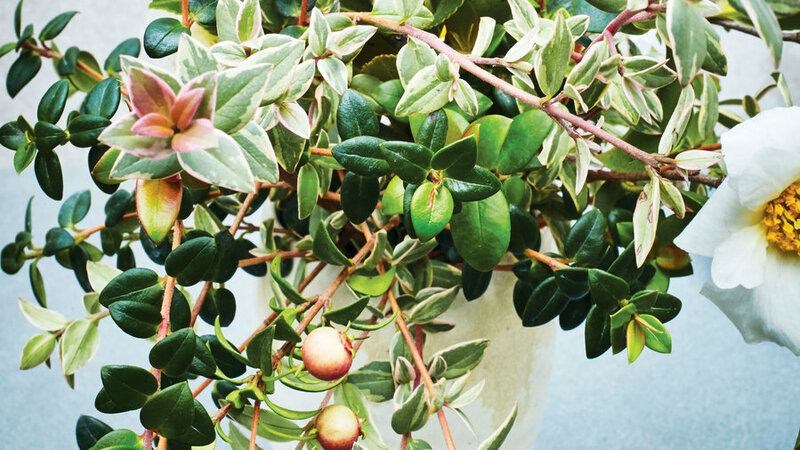 This one, from the book , uses foliage and flowers from Chilean guava and camellia in a small vase. 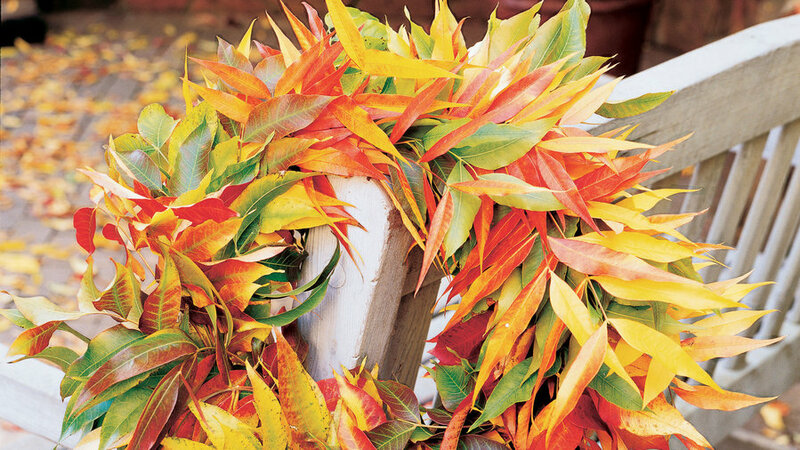 Use a variegated specimen along with solid, dark leaf species. Let the small fruits cascade and add the camellia flower for a focal point. Photo reprinted with permission from Harvest by Stefani Bittner and Alethea Harampolis, copyright © 2017, published by Ten Speed Press, an imprint of Penguin Random House LLC. Photographs copyright © 2017 by David Fenton. 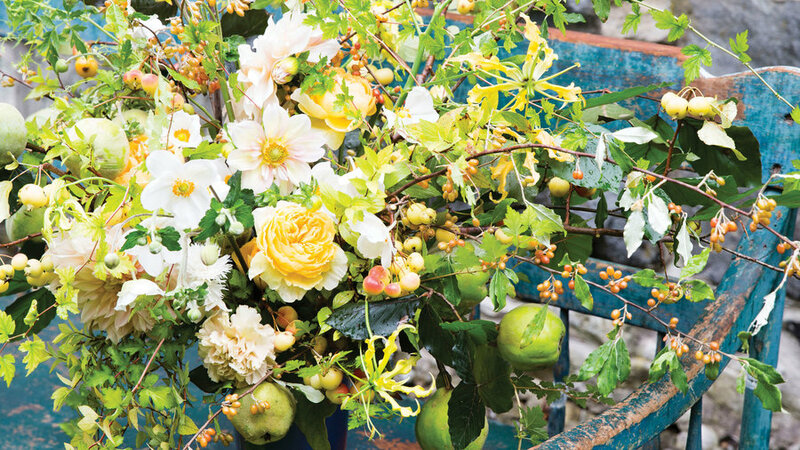 Inspired by harvest time, the bumpy quince, modest crabapples, and smooth olives are a pulse-like contrast with showy, late blooming roses and full, lush dahlias. This arrangement is from by Ariella Chavez. She recommends using a tall vase and cutting quince and crab apple branches so they curve over the edges. Reprinted with permission from The Flower Workshop by Ariella Chezar with Julie Michaels, copyright © 2016, published by Ten Speed Press, an imprint of Penguin Random House LLC. Photographs copyright © 2016 by Erin Kunkel. 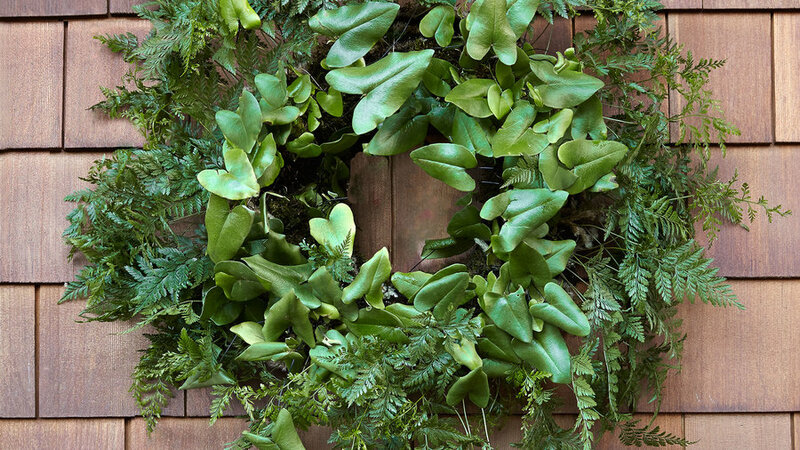 For temperate climates, this living wreath made of ferns and moss livens up a shady spot. According to Caitlin Atkinson, author of , once it turns 60 or below, you should take it in at night. Mist daily. Taken from Plant Craft © Copyright 2016 by Caitlin Atkinson. All rights reserved. Published by Timber Press, Portland, OR. Used by permission of the publisher. In milder climates, succulents do well year round. Because they have a shallow root system, succulents don’t require planters with much depth. This driftwood planter from has an organic feel and textured beauty on its own. Use a drill with a 1-½ inch saw bit and chisel to carve out a place to plant. Potted © copyright 2017 by Annette Goliti Gutierrez and Mary Gray. All rights reserved. Published by Timber Press, Portland, OR. Used by permission of the publisher. This simple outdoor décor for entertaining and celebrations can have a big impact when multiple glass globes are strung. 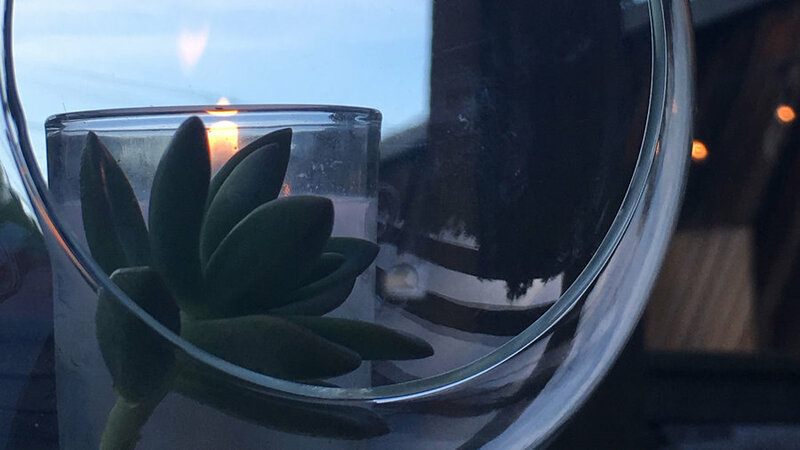 Each has a small clipping from a succulent, which can be replanted after the event, and a tea candle. You can try staggering the globes at different heights or make them more uniform.